Danish wind turbines set a new world record in 2015. Wind power is now counted for 42.1% of the total electricity consumption in Denmark, according to data published on Friday (15 January). 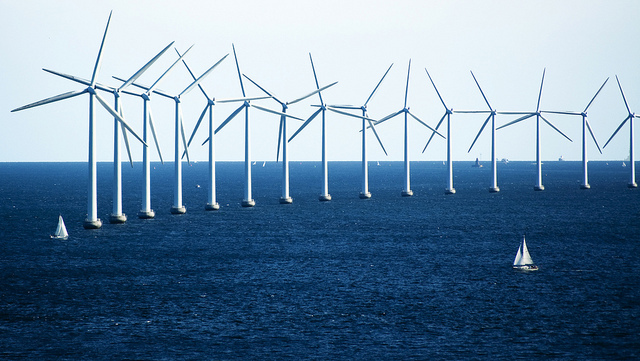 The percentage of wind power in Denmark’s overall electricity mix is the highest in the world. Last year, the share was 39.1%, which was a record, according to Energinet, which runs the power grids. Out of the 8760 hours of 2015, the western part of the country produced wind power during 1460 of them, said Energinet’s Carsten Vittrup. “It’s not unusual that we have hours where the wind production is greater than the actual consumption. But in the western part of the country, it has sometimes been 16% more, and that illustrates that with a volatile electricity production, we are able to import and export across our borders,” Vittrup said in a statement. The new Danish wind power was exported to Norway, Sweden and Germany, while Denmark bought hydropower from Norway and solar power from Germany. Power plants that run on coal and bio mass still play an important role as “buffer” in the power supply, Vittrup pointed out, when there’s no production of wind power or solar enegy. The Danish parliament wants the Scandinavian country to get at least half of its electric power from wind by 2020. According to the forecast, this target looks to be met. By 2030, the country hopes that 90% of the electricity and heating supply will come from renewable energy. In 2005, wind energy counted for 18.7% of the total electricity consumption. In 2010, the share had increased to 22%, and in 2012, the share was 30%. In the UK, wind power likewise had a record-breaking year. According to figures from the National Grid, 11% of the UK’s electricity was sourced from wind power in 2015 – up from 9.5% the previous year. Overall, wind provided enough electricity to meet the demands of more than 8.25 million homes – almost a third of UK households – compared to 6.7 million homes in 2014. After marathon talks in October 2014, EU leaders agreed on new climate and energy goals for 2030. They include cutting greenhouse gases by at least 40% versus 1990, and increasing energy efficiency and renewables by at least 27%. For 2020, the EU already has three goals: to cut emissions, increase the use of green sources such as wind and solar and cut energy use, all by 20%. 2020: The deadline for the EU's target of a 20% increase in the use of green sources, such as wind and solar energy, compared with 1990.